Duchess Kate: Happy 3rd Birthday Prince George! 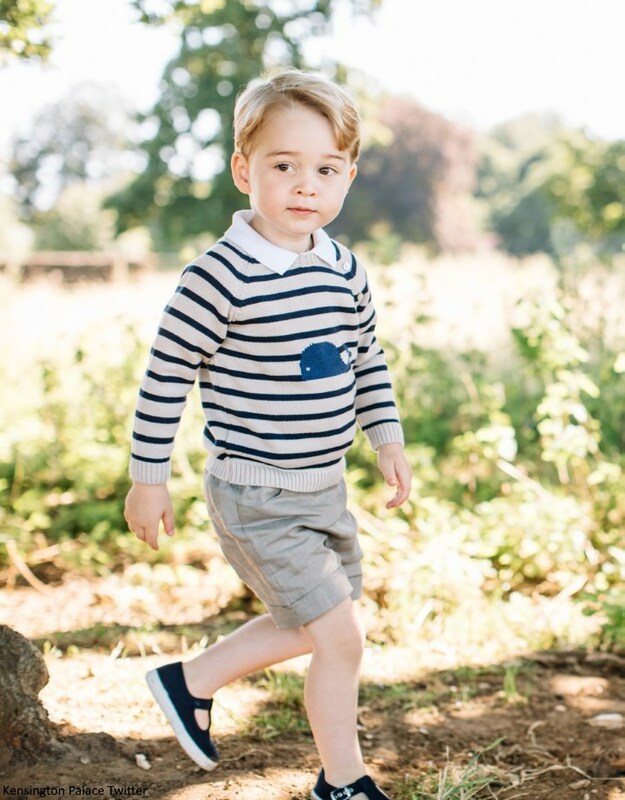 Happy 3rd Birthday Prince George! 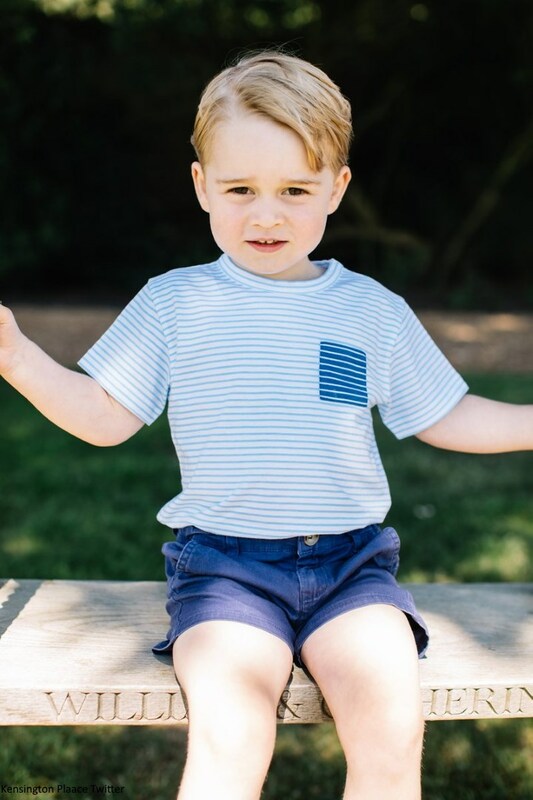 Our favourite little prince celebrates his third birthday today and to mark the special occasion Kensington Palace released four new photos. A Kensington Palace spokesman said: "The Duke and Duchess hope that people will enjoy seeing these new photographs. They would like to thank everyone for all the lovely messages they have received as Prince George celebrates his third birthday." The photos were taken by photographer Matt Porteuous at their home in Norfolk earlier this month. Mr Porteous said: "I really enjoyed the opportunity to take these photographs of Prince George. It was a very relaxed and enjoyable atmosphere. I'm honoured that they have decided to share these images with the public to mark his third birthday." 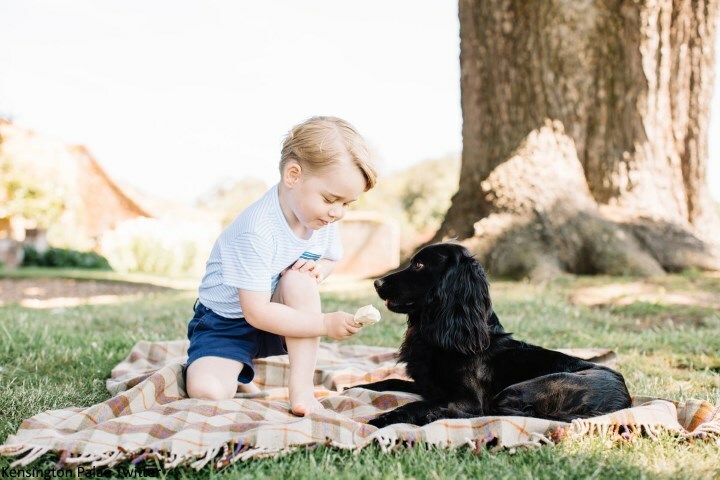 The show-stealing photo from the set for me is the image of George and Lupo sitting on a rug outside, it captures a lovely moment showing the Prince offering the family pet a taste of his ice-cream. A darling picture - one I imagine may take pride of place in the Cambridges' home. Note the swing is inscribed with "William & Catherine". It is believed to have been a wedding gift to the couple. The swing is by the Oak & Rope Company and can be purchased here. A closer look at George's ever-adorable expressions. 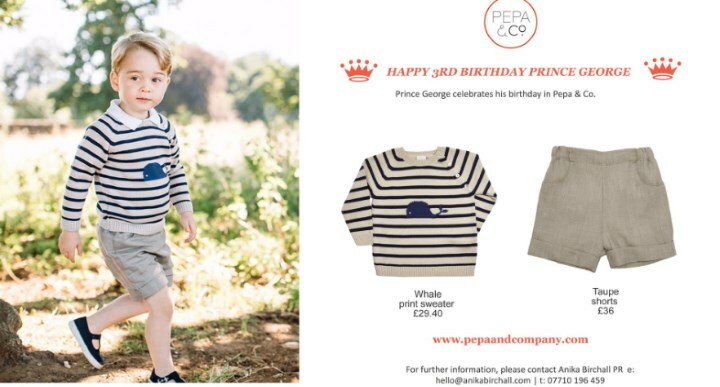 In the first photo, George wore a cute outfit by Pepa & Co. The £42 Whale Sweater is 100% cotton and described as a Baby striped navy and cream, round-necked, long-sleeved sweater. Made in a soft, knitted cotton featuring a cute blue whale design on the front. It has mother of pearl buttons on the shoulder for easy dressing. Hello! magazine reports his matching shorts are the brand's too. 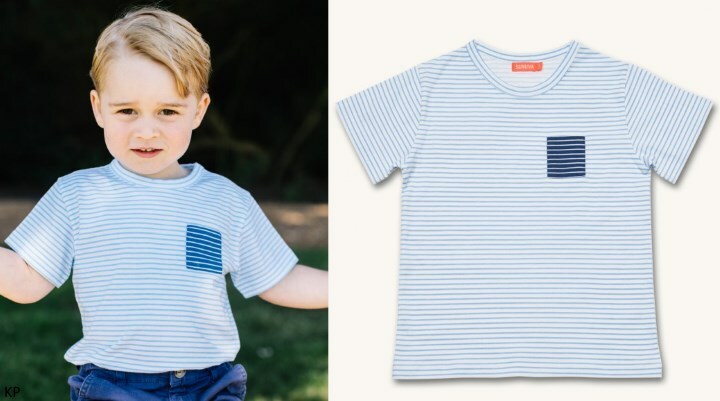 For his second outfit, George wore the Boys Blue/White Stripe T Shirt by Sunuva. We can certainly see Kate's love of stripes in her selections for George. The £28 piece is currently on sale reduced to £9. George also wore a pair of denim shorts and his Nantucket Canvas Shoes. How have William and Kate decided to mark their son's third birthday? People magazine reports the day will be celebrated "in the most perfect way" with family gathering for a special tea party at their country home, Anmer Hall. One imagines it will be a low-key event with a small guest list. Rebecca English reported newly-engaged Pippa was seen loading Party Pieces boxes into her car on Tuesday - thought to be for George's party. I imagine whilst the children are playing at the party, chatter among the adults will likely turn to the impending wedding. I'm sure it's been a hectic week for the Middletons with the announcement, and there's been a noticeably increased media presence surrounding Pippa, so it's a lovely opportunity for the family to gather and enjoy George's birthday. 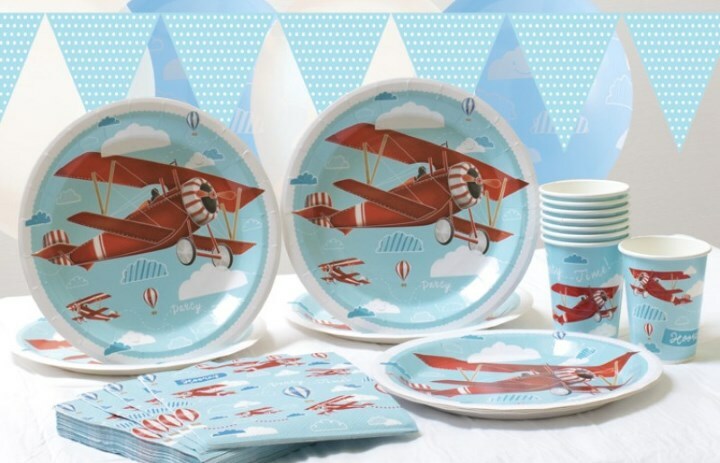 Glancing through the Party Pieces website, there's an endless number of suggested themes such as the Flying High Aeroplane Party, a strong contender given George's excitement at the air show earlier this month. 'The prince is known for his boundless energy and inquisitive mind, with Kate describing her eldest child as "a really lovely little boy". But William and Kate should take note. According to the parenting guide What To Expect: The Toddler Years: "Three-year-olds can handle a little more party than two-year-olds - but just a little more. Too much more can send pint-sized party-goers into celebration overload, with less than pleasant results." It's been quite a year for the future king, filled with both typical and not so typical milestones for a two-year-old, seen perfectly copying Uncle Harry's expressions on his way to visit the Queen - or Gan-Gan as he calls her - for the annual Buckingham Palace Christmas luncheon. 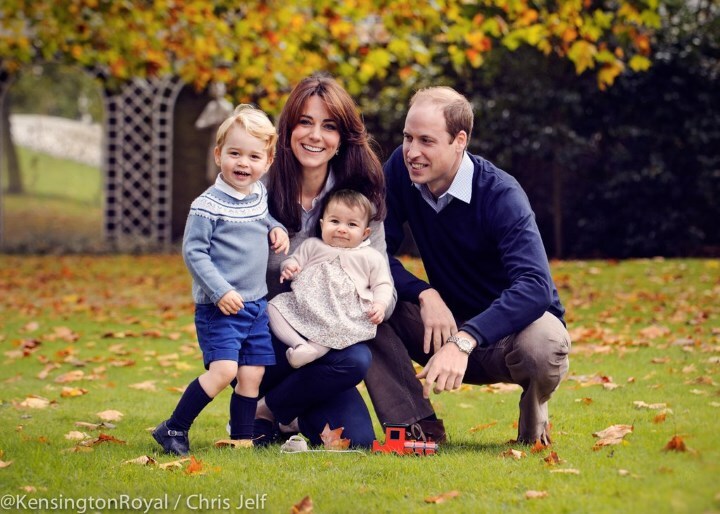 For the Cambridges' Christmas card photo, we saw the family of four smiling among the autumn leaves at Kensington Palace. In January, it was a landmark time for George who began his school life at Westacre Montessori School. 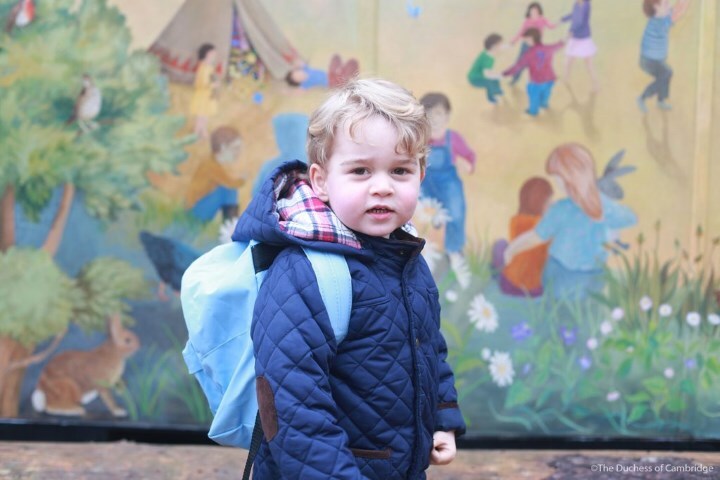 The Prince was taken to school by both his parents and Kate took a selection of snaps as he made his way in. In March, George and Charlotte played in the snow for the first time. 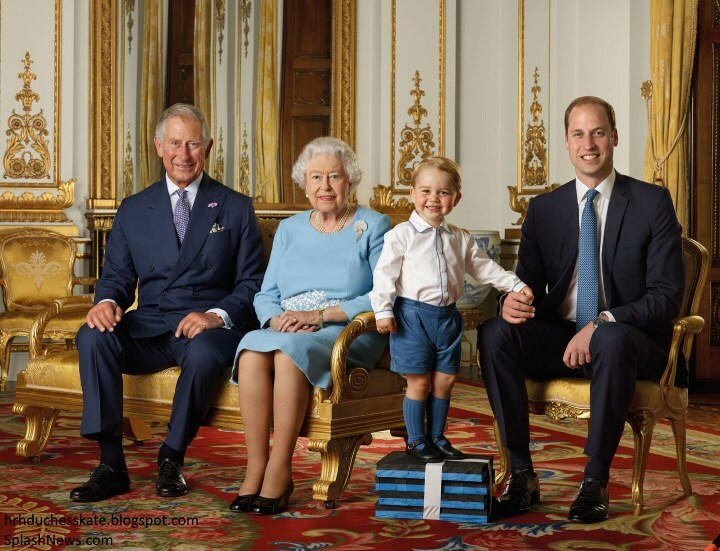 Balancing on gym blocks, George charmed in a new photo used for a set of stamps Royal Mail issued to mark Her Majesty's 90th birthday. 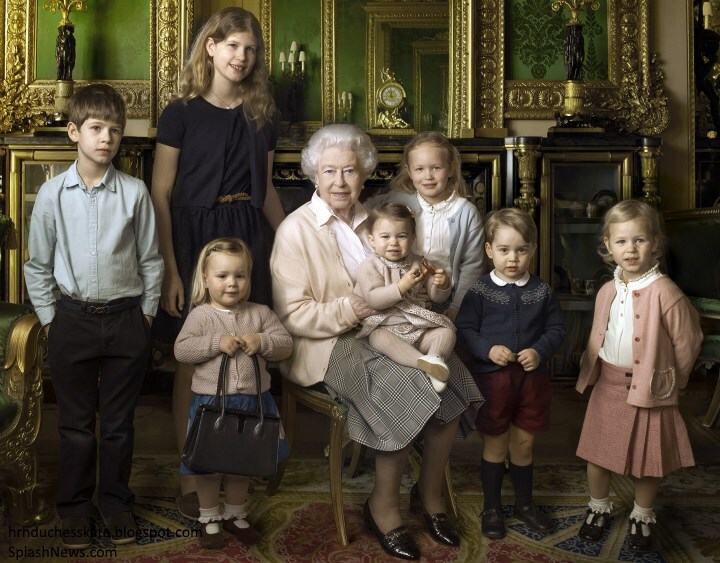 As her Majesty's 90th celebrations continued, a photo, taken on Easter Sunday at Windsor Castle by Annie Leibowitx, depicted the monarch with her five great-grandchildren and two youngest grandchildren. The children's parents were all there on the day, and Kate reportedly took photos of her own. George made his second Trooping the Colour appearance last month. It marked the first year of many we'll see William, Kate, George and Charlotte assembled together for. George appeared to be in his element, wearing the same outfit William wore for Harry's christening in 1984. 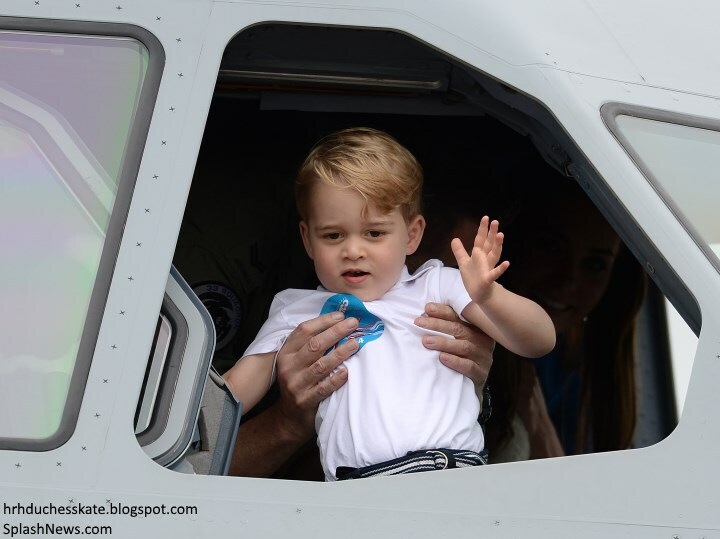 Another milestone for George over the past year has been a gradual introduction to royal engagements. Kensington Palace said: "The Air Tatoo is a fantastic family-orientated event and the Duke and Duchess know that George will enjoy seeing the aircraft up close." George appeared to have a splendid time exploring and looking at the abundance of aircraft on display. It was an excellent idea to take him along on an engagement where he could enjoy looking at the planes. A little wave from the Prince. We hope it's a lovely day for the family! We'll see you on Sunday when the Duke and Duchess of Cambridge will make a return visit to Portsmouth. The pictures are absolutley adorable! He's so big! Gotta laugh at the brenton stripes! I love it though! Also, the picture with Lupo is absolutley precious!! Also love that they have an engraved swing! So many precious pics from this last year :) And it will only become more and more as he gets older! Maybe an attempt at a Donald Trump comb over. Ha! Just kidding, of course!! These are adorable pictures! My favorite is of George standing on the swing. One thing I have noticed is that William and Kate are trying really hard to tame the natural curl George has in his hair. You can tell in these pictures that he has gel in his hair to straighten it and keep it in place. On the day of the Air Tattoo visit, the natural curl in George's hair showed because of the wind. I wish that William and Kate would allow his hair to be as it naturally is, without the use of hair products to change it. I know Kate has natural curl in her own hair but prefers to straighten it. As someone with naturally curly hair (and I like my curls), I'm sure this minor issue frustrates me more for that reason. These pictures are wonderful and the best part is that George really got into them. You can tell by the expressions on his face. I hope he has great birthday, surrounded by family, and then can take a long nap this afternoon! I read an interesting article that stated that they straighten his hair and normally dress him very formally when he's in public view for a great reason. It seems that when he's out and about with his curls and casual clothes he's mostly not recognized. Happy Birhday to this adorable boy ! Best wishes for the whole family ! I would like to see the color of his eyes - like his mummy's ? Hi anon, it seems like in one of the close ups of him in maybe the last post I remember noticing that his eyes looked brown. But I'm not sure. I've read several British writers who say that George's eyes are definitely brown. One writer commented that he will be the first brown-eyed English king since Charles the Second (1660)! Happy Birthday to our Gorgeous George! What about awilliam and Mary and Queen Anne? Their eyes appear very dark in their portraits. What is the color of his eyes ? It seems brown , but ti is impossible with blue-eyed father and green( hazel) -eyed mother .I think he has Kate's eyes ? Happy Bithday adorable little prince ! As I've heard, it's not impossible. The Blue+Blue and Green+Blue can't be brown that is taught in schools is a bit simplified from what I have heard. Kate has hazel with quite a bit of brown so I assume that impacts the genetics for brown eyes. My mother had green eyes and my father blue and I have green. Two of my siblings had green and two blue. My husband has brown eyes but there are blue eyes in his family too. Our two boys have brown and our daughter blue. Our five grandchildren are three blue and two brown. The two brown have brown eyes from their father and their sister has blue from the mother. The other two have blue eyes as they have two blue parents. None of the younger generations are green so maybe green is recessive. There was a closeup picture a year or so ago of toddler George that showed his eyes to be a darker hazel than Kate's, but not quite brown. Her father and Pippa have very dark eyes, while James Middleton's eyes are blue. The Middletons have the sort of mixed genes that, along with William's grey blue eyes, can produce a variety of eye colors in the descendants. 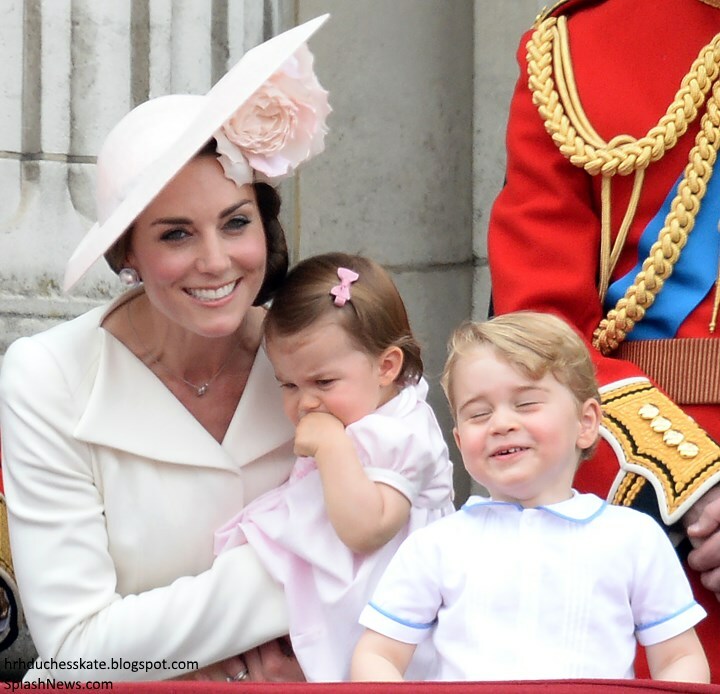 I think Charlotte's eyes are darker than George's, as are her skin and hair, more like Mike Middleton's coloring. Other than his eyes, George's coloring is more like the Windsors and Prince Philip. 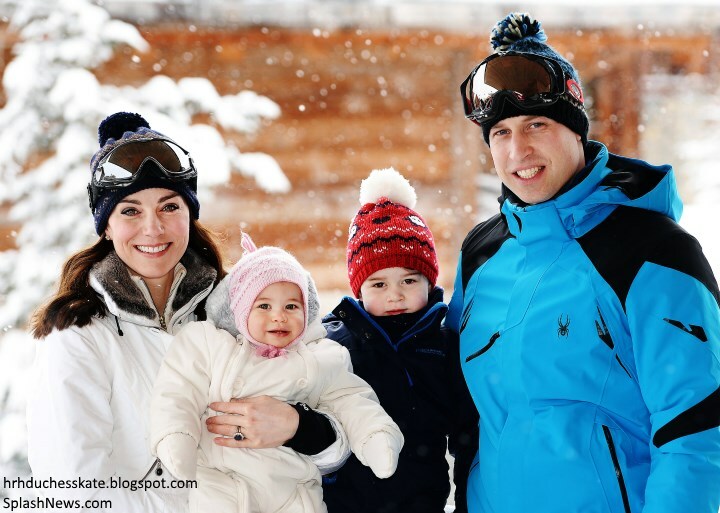 It shows it would not be difficult for William and Kate to have a brown eyed child. Well they did, Julia. Some of this eye color talk carries a disturbing innuendo. Not yours-you are trying to counteract that, I believe. such remarks are in poor taste, to say the least. Does everyone forget the beautiful,well-lit inside photographs Kate took of Charlotte? She has gorgeous blue eyes. My ex husband has hazel eyes and mine are very light blue. Two of our kid have very dark brown eyes and one has hazel. My parents both have dark brown eyes and my sister and mine are blue. Genetics can create all kinds of interesting combinations! What a darling little boy! Thanks Charlotte for posting these adorable photos and for the look back at PG's year. Lovely photographs. Thank you Charlotte. That is an exquisite tribute to George for his birthday. It could not have been done any better, in my opinion. William and Kate would be so honored by such a loving piece of journalism. A crowning page for the history books. George's tshirt matches the red striped shirt Kate wore for the vogue photo shoot! George is absolutely adorable, and so tall! It's hard to believe he's only three years old! I wonder how tall he and Charlotte will be. George looks so grown up in that first photo. And I am so glad that Lupo made it into the photo. He looks like he is holding his own around two young children. Yay, Lupo. Nice blanket also. Looks like a classic English wool plaid. Any Information on that? romantically monogrammed. I wonder if they have ever use it much. Glad Pippa's ring sparkled in this photo. In other photos it looked rather dull. No question about the quality of the diamonds now. That seems slightly rude. Unfortunately, I haven't found someone to marry before three of my grandparents passed away and, yes, I would have liked them at my wedding. Not rude when you consider the girls have been dating their boyfriends for years. Certainly not the first time someone has posed the question about when the girls are going to make it official. azaluckyj, I understand how deeply the loss of a grandparent is felt. They were lucky to have you. I suspect anon 13:28's comments are simply a reference to the long history both York princesses have with their boyfriends. Beatrice and Eugenie each have found someone. They have been dating the same fellas since they were in high school or early university. Well, it's not like they're fooling around (which they have all the right to do). They are both in longtime, steady relationships. It's noones buissness why they're not married, but it seems very odd to call it "flitting around". Not odd at all, the media often says that in one way or another. Every term you can think of for party girls, etc., "flitting" from one party to another, one club to another, one luxury vacation to another, one social event to another ......... And they have questioned more than once why the girls don't take on more Royal Princess responsibilities and settle down. Exactly, 02:57. That is exactly what I meant. Thanks. I did not interpret 13:46's comments in a negative way. And my grandmother passed away two months before my wedding. I understood this comment as well. I did not perceive it as mean ... it is reality. I've now looked through some of the other work of the photographer and I have to say I really love his style. It's colourful, clear and no fuss. Not the most out there art version of photoraphy, but why reinvent the wheel? Perfect for family photos! I hope he becomes a regular staple in their rotation of photographers! Gosh three years passes so fast. I remember watching here in the states when they announced that Kate had went into labor, and then when it was announced that she have given birth to a son. He is such a handsome boy. It's also great to see Lupo as well. He's getting a bit old to call him a tot any more so I'll say he's one adorable little tyke. I think my favorite photos are a toddling one year old George looking a bit like Winston Churchill and the one where he's copying Uncle Harry above. Erika, I still can't believe 34 years have gone by with William! I love the swing too, the Telegraph is reporting it was a gift from Prince Charles, apparently they're made out of oak from the Duchy of Cornwall forests. And he also had engraved swings made for George and Charlotte when they were born. Very sweet gifts! Claudia, very nice gifts indeed, if true. Truly. And it would make sense given Charles's passion for gardening. That is sweet. I wonder how true it is, though. If George has his own engraved swing, why wouldn't he be photographed on it for his birthday pic, and (perhaps) a family portrait featuring the W&C one. Nice information about the origin of the swing. share it. What two year old shares willingly, without loud protests? I'm sorry to say of all the photos they've released, I probably like these least. Nothing against George, who is adorable, I'm talking about the style of photography. They seem to be determined to have photographers use this filter that gives everything a strange, surreal, faded look -- it's a dramatic filter in the right circumstances but in toddler playtime photos I don't think it works. It also leaves it looking far too stylized and staged, nothing lively or in the moment about it. It's odd that Kate keeps choosing different photographers and they haven't developed a relationship with one or two. (and I won't even delve into the royal photog relationship) It's as if they have some style in their mind that no one has captured satisfactorily for them yet so she keeps chasing it! And given she's a keen photographer herself she may be overthinking this. The best photos are almost always the most simple and candid. Now, as a dog owner, chocolate is an odd prop to use in a photo. There is a very short list of things you do not feed your dogs, that you actually keep them away from at all costs. This is drummed in to you by every kennel and vet. Chocolate is on top of that list. It is in fact the most common form of dog poisoning. It may seem like nothing to people who aren't familiar with dogs, but it's quite foolish to show George feeding Lupo a chocolate covered cone. (ice cream is also a no-no, but far less serious) And given that these photos are going to be seen by millions and perhaps copied, quite irresponsible as well. There is no chocolate whatsoever in that photo. And we do not even know if Lupo got as much as a lick. I have dogs and they do get the occasional ice cream treat. My kids have shared their treats with our dogs. I assure you, they are as healthy as can be. Mountain out of a mole hill. What this particular photo shows is a sweet boy sharing a loving relationship with his best mate. As an animal lover, it is my favourite pic! White chocolate isn't at all dangerous as it doesn't contain the chemical the makes milk and plain chocolate toxic for dogs in varying quantities. Most dogs are not allergic to milk products - many puppy classes in the UK recommend small chunks of cheese as rewards and my 14 year old dog has eaten cheese and ice cream pretty much her whole live. I don't see a problem here. I am a dog owner also, and yes, chocolate is a no-no for dogs. However I have looked at that photo, and all I see is vanilla. The beautiful little prince might have had doggie ice cream in his hand. Uhm.. no choclate there. Well, white chocolate (which contains none of the harmful ingredients found in dark chocolate). And dairy can be bad for a dogs tummy, but for a dog that size he could have gulped that whole thing without any tummy troubles. The media and some people has really overreacted to that, imo. Lupo probably eats way worse things in the garden or of the floor. I don't understand that it is chocolate, it looks like vanilla to me. We've had dogs for millions of years, and never thought giving them a little bit of an ice cream bar or cone was a big deal. This isn't a chocolate ice cream; I wouldn't give them that. Even white chocolate, which I understand some think this is, is not particularly dangerous from what I've been told, and I do pay attention to that stuff. Claudia, you say the best photos are simple and candid. Well the ice cream was certainly candid. I too am a dog owner and am very aware of things that are bad for dogs. But my Australian cattle dog has stolen a container of chocolate (the fake kind that is also on ice creams) biscuits with no ill effects. And an entire container of fish flakes. Her latest adventure was with chili pepper. I have posted her escapades on Facebook with my friends. Granted that I usually preface by saying something like "Most dogs would be deathly ill but Mitzi doesn't realize...." I knew someone would make a fuss as the tabloids, as usual, are up in arms. For me, I look at it as a photo of children will be children. And George hasn't crammed it in Lupo's face. 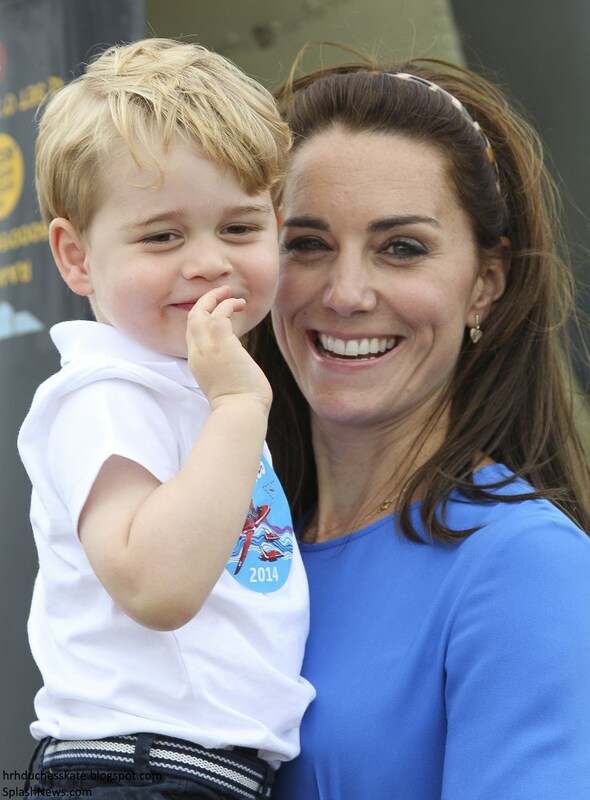 I imagine Kate was telling George "No, don't do that" just as the photographer snapped the photo. Has happened to us all and makes them human. It doesn't look like chocolate to me? Half of the human population would love to be taken care of as well as Lupo is. A total over-reaction in my opinion. The William and Kate haters pounce on yet another non story. Hope they had a great party. I have to agree. The poor dog was probably sick later. Chocolate? Not seeing any chocolate. Everyone of my dog loving friends is guilty of this crime. comment, would that be allowed? three had a different opinion on what George was holding. Maybe the Nanny gave it to him. The photographer, without Kate's permission. IMO, the photos are lovely and each expressions says much about how happy, confident and curious this little boy is. This speaks volumes for W&K and those near and dear. Regarding "active" photos ... these are official photos vs. vacation shots. The focus here should be on the subject, and not the surroundings or an activity. IMO. I think the choice of varied photographers is wise. George needs to learn to be comfortable in front of many folks taking his picture. After reading an article or two I see people are saying it is white chocolate. I looked more closely after reading that and there seems to be a white chocolate shell. People will gripe about anything!! One person tweeted George should be put in prison and it's animal cruelty at tax payer's expense. Quite laughable if you ask me! My apologies if this is a duplicate - my computer has also be eating where it should not and seems to have gobbled my comment. I do tend to agree with Claudia - I would have preferred to see George giving Lupo a doggie biscuit, but hopefully no one will take this photo too seriously. It is a charming snap but I do think most people will realise it's staged - there is no ice cream on either George or Lupo while in real life, both would be quite sticky. But people, while my spaniels are very jealous of Lupo and his licks - I would certainly not recommend ice cream and absolutely not chocolate. One of our naughty little ones did get into chocolate and had to have her tummy pumped - she was unrepentant, but we have been very careful since and were warned by the vet not to give them any sort of sweets as even a little can cause pancreatitis - which can be very dangerous to dogs. So those who say they give a bit of sweets - give doggie biscuits instead. Julia insists, even though the spaniels are protesting. I've never heard of dog ice cream but the spaniels are urging me to look into it - perhaps they don't have it where we are. Anonymous 21:58 - Claudia does have a legitimate concern - your language is quite strong. A cone will raise controversy since so many people see the photos. As for Lupo, he is extremely well behaved - our wicked little pack would have grabbed that cone and been smiling, and the photo would have been spoilt! George is being very gentle and respectful of Lupo. HalleluYah. I had been more than a little concerned that George, who apparently "has boundless energy and an inquisitive mind", and is a boy, might have had Lupo running for cover most of the time. My concerns have been assuaged, thankfully. Kudos to Maria, William and Kate. Lupo's coat looks so shiny and healthy also. He no doubt eats organic. Shame on those who would suggest animal cruety. Those who would, really need to go adopt a dog or cat that really is in crisis. Lupo doesn't need you. Looking at the photo - I too noticed that Lupo isn't looking at the ice cream or even at George. Most unusual if George was spontaneously offering him an ice cream. At the risk of upsetting people, I think this was someone's idea of a cute photo, not a captured moment - although it may have been based on a spontaneous moment from the past. There is nothing wrong with that - most professional and even home photos are set up. Especially with dogs. I think someone may have been commanding Lupo (probably to wait or hold) over George's shoulder, and we don't know if the "treat" was even real. Lupo's lack of interest makes me wonder. Spaniels tend to be very greedy. They are also wonderful with children for the most part - so a lively little boy isn't likely to trouble them. For those who like dog photos, there is a brilliant dog photographer who wrote a book - Sally Anne Thompson. She takes photos you would believe were captured in a spontaneous moment but the book - written long before computers and photo shopping, show a variety of techniques that can be used to create these charming scenes. She has a web site too, I believe. Why there has been some bother about this is more the concern about setting examples. Really, dog shouldn't be fed sweets - some tolerate it better than others, but it's not a good idea. Let's hope most people realise that. I noticed that also Julia. The one where Kate, William, George and Lupo are in the window has the same effect with Lupo. Lupo seems like he is looking at George but isn't. Lovely photos! Reflecting a little boy who is growing up happy and loved. Another site said that some of George's friends from Montessori had been invited to the party. I would think that probable, wouldn't you? What sweet pictures of George. He looks to be having a wonderful time in the country. I love having a picture with Lupo. My dog acts the same way about ice cream. I saw that some people are up in arms about that and saying it's animal cruelty which just astounds me that this type of picture would cause that reaction. But anyway, I have really enjoyed seeing all the pictures of George over the last 3 years and seeing how much he has grown and changed. I think that swing is a great wedding present for a couple and will keep it in mind for my friends future nuptials. Lovely pictures. Love the William & Catherine swing and that they had George sit on it for photos! Love too, how they capture the continuing relationship of George & Lupo. =) Such a lovely family. I'm not trying to be overly critical or whatever, but I wonder if Pippa's fiance felt he wanted Pippa to have a ring that is equally as beautiful at her sisters, seeing that the sisters are so close and are captured so often in photos together as well as compared to each other in everything. I'm sure he of course did it with love, but that's a HUGE ring--seems nearly as big in size as Catherine's. It is pretty though and I wish them the best. Well, he's super rich so I think this is the kind of ring he would go for either way. I think that was part of it. We forget that they have a social life that we don't see and Pippa is most likely a big part of it, and her fiance as well. So when they socialize at dinners and parties, Pippa is going to fit in with all the aristocrats who have family jewels and can afford bespoke designer clothes - her husband will see to that. That's why you see the York princesses only date mean with means - to keep up appearances. I would assume that in the future Pippa and her husband will be invited to a LOT of functions with her sister and William. 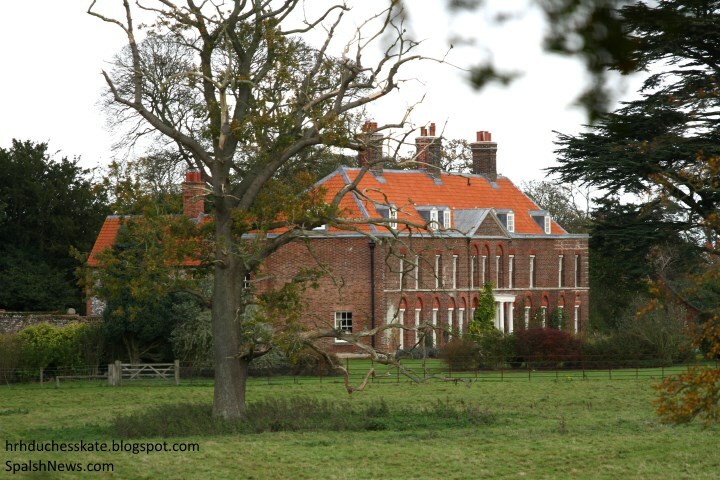 We'll wait word on what house James buys her in Norfolk so they'll have a country pile to raise kids as well. with Alex Loudin. They are still very good friends. She was also roommate at university with the Earl of Roxburghe, Ted Innes-Ker. They are still good friends. She dated "JJ" Jardine Patterson, of "THE" Hong Kong banking family, for three years while at university. And if you note all the aristocratic weddings she has been invited to you might want to have an adding machine around. I understand that Matthews obviously wants to give Pippa the best of everything, but she hasn't had to go without much prior to this. And, in addition, since she became the sister-in-law to the future king, and sister to the future Queen, she doubly doesn't have to try to "fit in". Even prior to that, as the weddings invitations, etc., attest to, she was always invited to LOTS of functions with William and Kate's peers. They have all been friends since Marlbourough. James may or may not buy Pippa "a country pile"
$17 million home in Chelsea (with a new master closet and his and her sinks), an available get-away-to home in Scotland that looks like a fairy tale castle with 10,000 acres, and if that isn't enough, she can vacation on St. Bart's at Eden Rock when she wants. Even considering all of that, I wouldn't be surprised if they do purchase a home in Norfolk. Actually, I'd be surprised if they don't. I think that is very simplified Moxie. The reason they date people with means is probably not because of the money per se. It's because those are the people they meet, run into. The people that follows around on the vacations on expensive islands. Actors often date actors because those are the people they meet. etc etc. I have to say, your comment seem very judgmental.. Unecesarily so. This all falls into the realm of no-winning either way speculation. Whether we do it or the press does it for us, there's no keeping up with the veiled trash talk that this sort of reporting is. First Poppa is hiding her hand and the press reacts. Then she's "flashing" it constantly (But who is constantly there to snap every angle of it?) and Tattler goes to town with advice for the newly engaged. No surprise, then, to see that perhaps this is another instance of one-upmanship between the sisters. First the white dress, then the shapely derriere, now ring wars. Even the mothers aren't left out of it. Who is the most controlling? Who will win the fashion stand-off at the wedding? Blah, blah, blah. The less attention paid to that sort of tabloid nonsense the better. Pippa has been on the cover of the society magazine "Tatler" more than once as the most eligible society girl. The aristocracy aspires to her. She definitely is in her element in aristocratic circles, like a duck to water. She was totally at ease moving about in Buckingham Palace when helping to plan and arrange things there for the Royal wedding reception. She pretty much took charge. She attends the Boodles Ball, etc. and has for years. Norfolk is so far way from London by driving ( 3 hours) in the complete opposite direction-of the rest of a fair amount of society and out of the "mainstream run"( in Berkshire with the parentals and Windsor,etc) - asides from the Houghton Hall "crowd"?? I'd think that that would be slightly bizarre for Pippa to decamp to there- then again- maybe so... :) - I'm sure they'll be able to afford a few spots - and to allow the future cousins to hang out together....have to wait and see, no? I wouldn't say the aristocracy aspires to Pippa - or being on Tatler covers makes it so, or she might be marrying into the aristocracy. -and I don't think Pippa had much involvement with the reception at Buckingham Palace - my understanding is when outside help is needed the queen's cousin Elizabeth Anson (Lord Lichfield's sister) handles it and I seem to remember her talking about the wedding. But I'm sure Pippa fits in fine. And she's marrying a man who loves her, who shares common interest in extreme sports, who was friends with her before being a lover - all of which makes for a strong union and one much better than being wanted for who your sister married - as Pippa, who was dumped by her boyfriend when William broke with Kate, probably knows better than anyone. As for the ring, I should imagine James picked out what he thought she would like more than the statement it makes -perhaps she even had some input. There is no reason to compare it with Kate's historic one - it is simply a lovely ring that suits Pippa. I understand the desire to focus on Pippa "snatching" a millionaire. But may we stop and consider the qualities that Pippa (and Kate!) bring/brought to the table and what appealed to James (and William)...? Pippa did help with the reception, working with the palace team. Please don't ask for references. lol. I remember there was some discussion between Pippa and the palace liaison about a disco ball. Pippa got the disco ball. Very good point. Alex left Pippa because of all the attention (particularly that night she danced with that tall guy and he picked her up on the dance floor, all of it photographed, while Alex sat there). He broke up with her soon after that. Nico moved away, and Matthews was usually near the whole time and got to be around Pippa and her family in different scenarios while Pippa may not even have had a clue that he was liking what he saw with her and her family. Pippa truly aspires to do the right thing I think and now she has found a team player, or, he found her. I pray neither one of them (or his parents) are into one up man ship. Happy 3rd Birthday, Prince George! I hope you have a wonderful day full of love and celebration! Enjoy your day precious boy! Happy birthday to your son, Kate. Ditto! Happy lovely birthday Prince George. Yes, she would.... No doubt. What an adorable little boy!! These photos are priceless!! Made my day! Beautiful little boy. I need some lessons from someone on how to take pictures of small children that don't look like a total blur! Or else mine just move way faster than this little guy! I hope he has a happy birthday and a very happy year ahead. Lovely post, Charlotte, with all those interesting details we love from you. Precious little boy! Happiest of birthdays Prince George! What a unique, cool wedding gift that swing is!! I can't help it: Prince George looks just like the storybook character The Little Prince! Charlotte, I particularly like your homework of historical content on this site. I was thinking the same thing, my DQ has a doggie cone also and I know my 4 year old has tired to share her ice cream with our dog. It is silly that people are making a big deal out of this picture, especially since it looks like Lupo is not interested in the ice cream. Yes, I let my dog have one. He was disappointed it was not ice cream. Whipped cream?? Dogs normally do not digest dairy products. The only adult animals who usually do are humans. It does not appear to me that there was chocolate in the picture. It would be toxic for Lupo. Heck, bluhare. Let the dog have the ice cream. I'd go for the cup of whipped cream.It is real whipped cream, isn't it? What a precious little boy. I love the photo with Lupo. He still looks like Michael Middleton. Great post Charlotte. Me too. The photo with the dog is my favourite. It is very sweet, natural and exudes family warmth. Lupo and Marvin are lucky pets. I am sure the kids love them to bits. a really delightfull little boy ! but definitely , Kate makes the best photos of her children ! aaawh Nicole. That is so poignant. I can relate to that also. Hopefully, George's friends won't tease him about that when he is older. So funny you should mention your negative memories associated with greeting guests in your pajamas and robe because it used to mortify me as well. In addition, I remember being highly offended that I was not allowed to join everyone for dinner. The worst part is that I've had my children say goodnight to guests in their robes when they were younger even though I hated it as a child. 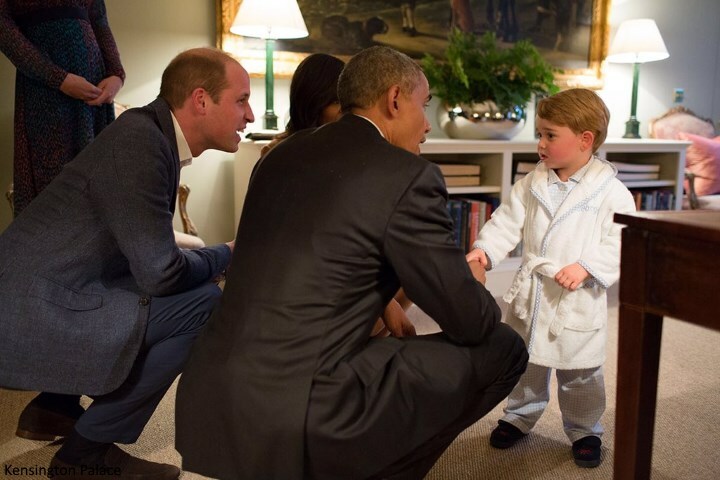 Actually, I never minded it, but when I was a bit older than George, I longed to sit with the adults. But then came the time when I was told I was expected to join my parents with company, and I hated having to be on my best behaviour, having to make polite talk and remembering all those rules at table. So there's no winning. Happy birthday, Prince George! -and thank you so much, Charlotte, for this beautiful post which has me smiling from ear to ear. Although, if I may respectfully disagree with the picture you suggested for the pride of place- surely this honor has to go to the first picture of you post, the one with Prince George in the whale-bearing sweater! How lovely, thank You so much Charlotte. George looks like his Grandpa Micheal, but in this last picture his look reminds me of some of his Grandma Dianas pictures. I like these new photos of George. Really stuff a three year does. Lupo looks so wise, like, "nope, not into ice cream Georgie, sorry". I do agree with Claudia about the cropping of the first photo and the one of George sitting on the swing. Those are basic things and seems strange that that photographer did those that way. Lupo photo. I don't know if the twitter rant had yet begun. As hair-trigger as that forum is, I imagine it had. At any rate, most of your readers were either non-twitter subscribers or chose to ignore the effort to ruin this gift from George's parents. Catherine did not take the photos, possibly because of the tempest caused previously.Now the criticism is the wrong photographer, etc. The internet and "social media" are great tools, if used with restraint and consideration. Otherwise, they become just another weapon that ends up in the wrong hands. Darling pics!!!! I love the one of George standing on a swing! When we were young, we would love to pile in the car with our beautiful Samoyed dog and go to DQ. We would say"Dairy Queen!!!" and she would get all excited!! She would always get her own cup and lap it up in sheer delight! Plus...in the pics, Lupo seems perfectly relaxed and content...like he isnt even remotely interested in the cone. Who knows id he even ate ot or not??? The photographer may have thought it was a darling shot, and before all the broo haha broke out, I agree. Very charming photos - and I'm always happy to see Lupo. (But my sobbing spaniels will tell you that they are not allowed a chance at such treats.) I think the photographer did a very nice job. My favourite of all the photos is the one at the Trooping because it is one of the few where George seems to have really let himself go and looks so joyful and just a bit cheeky. When he smiles, he reminds me a lot of William, but I have a poor eye for such things. Pippa's ring is lovely. I hope she is careful going about with it in London - perhaps they have security. But it is a beautiful cut and suits her well. Nice to see her black spaniel too in some of the papers. Charlotte has done a lovely job as always of assembling photos. Julia, I too think Charlotte did an outstanding job with the photos in this post. Anonymous - a black Cocker jamboree would be so much fun. royalfan - it gave me the chills too - there has always been crime in cities, of course, but these days, motorcycle thieves are terrible and brazen in London. Even if she has a paste copy of the ring to wear - they might try an attempt. I hope James has hired security - can't imagine he hasn't. I do hate all this talk of the price of things - rings, houses, clothes (although, I'm probably guilty of it at times too.) I do remember there was talk of the price of Diana's ring though - since it was in a catalogue. But today, there seems to be a price for everything. But who knows what Pippa's is really worth - it's priceless to her. The dog did not have ice cream. The Middletons have raised dogs for years. Anyone who thinks that Kate would give a dog ice cream is clearly not thinking. Of course she knows this is bad for them. I suspect its doggie ice cream readily available in the freezer section at my local grocer amd some pet stores. As to the quality of the pics? Why must they be scrutinized? Picked apart? Debated? Come on you lovely people can we not just be happy to have four(4) ? Wow thats awesome! Who cares about filters and chopping here or there? We should be grateful for any photo! I do not understand the need to break it all down to the minute? 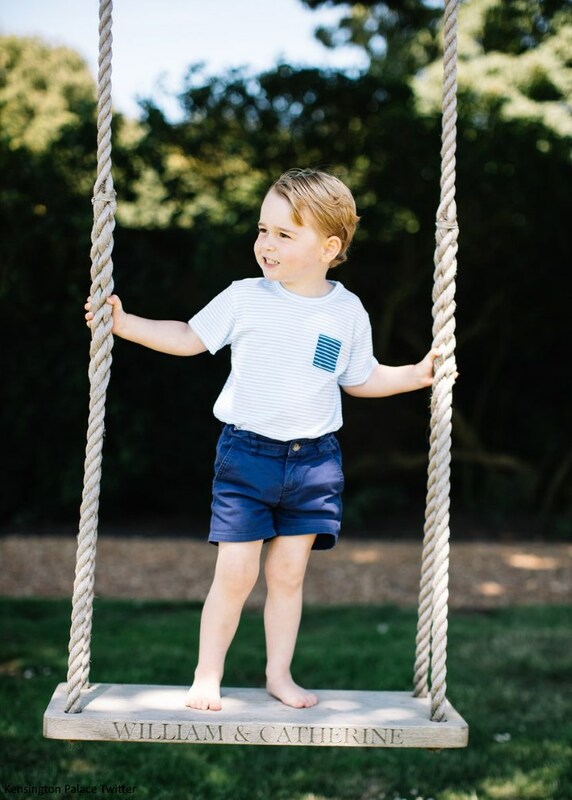 Lets just say Happy 3rd Birthday to Prince George Alexander Louis and THANK YOU to William and Kate for sharing with us and giving us pics of Lupo and that swing! That is a personal touch and its lovely! The world is in bad shape right now. The traumas come daily these days and the quality of a picture that is really a gift for all of us is just meaningless. Lets be happy for the moment! You are perfectly right. ooooh, my bad. I commented on the cropping. I also agree that that was most likely doggie ice cream. I doubt Kate would give George an ice cream for him during picture taking. Just a guess. Thanks for calling us out on those things Diane, lest we forget that and not be appreciative. I do think it's acceptable to make remarks in the comments section - royal photography has always been critiqued. Almost all here agree they are lovely snaps. I have to confess that's why I'm not a follower on Instagram - all those similar remarks about how splendid something is seems a bit banal to me. So we all do see things in our own way. I agree, Diane! Happy birthday George and thank you W&K. The news is depressing these days, and this is a lovely distraction. Having computer issues...including elsewhere page loading. Ugh. These photos got me a bit teary eyed. Gosh this little boy is growing up so fast in front of our eyes. He's gotten so tall and looks very sweet and attentive. And there's something poignant about the William-&-Kate swing and their gorgeous child sitting on it. If it was indeed a wedding gift it adds another dimension to their family saga. Good to see Lupo too. He's a lucky dog to belong to such a loving family. Lovely photos, thank you! My favourite is the one on the swing. What a cute little boy! My cousin's son is just 2 days younger so I keep comparing the two as to the size etc. :) (Funnily enough, his name is Vilem which is the Czech for William.) Have a good day, everyone! Amazing how the names are so similar. Thank you for the retrospective, the perspective and the prospective. Nicely done. Prince George is so adorable. The picnic blanket was a cute idea for the photo. It looked very British! Beautiful photos, and I especially love the family portraits! Not to be nitpicking, but in the photo with Lupo, what is that in the background, upper left quadrant of the photo? I can't distinguish what that is. It doesn't look like Amner Hall does it? Maybe a temporary building or storage shed. Even royals have to be practical at times.